With a number of new parties seeking to win seats and an anticipated victory of the left, the upcoming parliamentary elections in the Czech Republic might lead to the biggest change in the country's political map since the 1989 revolution. 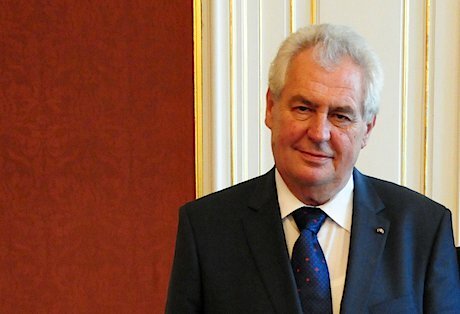 Czech president Milos Zeman. Flickr/Latvian Foreign Ministry. Some rights reserved. Only a few months ago, no one would have expected that 2013 would turn out to be an election “super-year” for the Czech Republic. The first-ever presidential elections took place in January, while legislative elections were originally scheduled for the spring of 2014. But then the political scandal broke involving Prime Minister Petr Necas. The whole cabinet was forced to resign, and as it was replaced by the technocratic government of Jiri Rusnok (a man loyal to president Milos Zeman), it started to become clear that the country was heading towards a period of unusual political instability. The new cabinet failed to win a confidence vote and MPs eventually voted to dissolve the parliament, triggering early elections. Two main issues stand out in the forthcoming elections - the emergence of three to four new parties likely to win seats in the parliament, and the ambiguous role of President Milos Zeman. The party expected to win the highest number of mandates is the Czech Social Democratic Party (CSSD) – to the detriment of Necas' right wing Civic Democrats (ODS), a party ravaged by scandals of clientelism and alleged connections to the so-called “godfathers” (i.e. networks of powerful businessmen and lobbyists who have had great leverage over public procurements in the country). For this reason the Civic Democrats - one of the strongest and most established parties in post-revolution Czech Republic – is expected to receive only 8 to 10 % of the vote. Nevertheless, CSSD is facing internal problems as it is increasingly split among two factions – one that supports Milos Zeman (who was formerly chairman of the party) and one that wishes to keep its distance from the president. So far, the polls attribute the second place to either TOP 09 (a centre-right party that formed the last coalition cabinet with ODS) or the Czech Communist Party (KSCM). But there are also a handful of ambitious new players who could have a considerable impact on the result of the election. For example, the Party of Civic Rights – Zemanovci (SPOZ), which describes itself as a political grouping of the followers and friends of Milos Zeman, seeks to use the momentum of their “spiritual leader” being president and get into parliament for the first time. Although officially unaffiliated with the party, Zeman is its honorary chairman. In addition, the secretary of his presidential office is one of the leading candidates of SPOZ. Another strong new player is ANO – a party founded by Andrej Babis, one of wealthiest men in the Czech Republic, whose Agrofert holding consists of 230 companies operating in the fields of agriculture, food processing and the chemical industry. Being a successful businessman, Babis claims that as the extent of corruption in the country has become unbearable for business, he has decided to enter politics and attempt to provide some solutions for this. Similar rhetoric is heard from Usvit Prime Demokracie (The Dawn of Direct Democracy), the party of Japanese-Czech businessman Tomio Okamura, whose platform is to propose direct democracy as a solution to the corruption, nepotism, clientelism and kleptocracy that has become synonymous with Czech representative democracy. Along with the Green Party (Strana zelenych) and the Christian Democrats (KDU-CSL), who might reach the 5 % election threshold, a total of seven or eight parties seem to have a real chance of winning mandates. On the one hand, such a number represents many possibilities of coalition and opposition bargaining; on the other, this political dispersal may threaten the smooth functioning of any future parliament. The overall focus of the parties’ political programmes is domestic – above all the struggle against corruption and unemployment. Only one larger party (or rather a voting bloc) is building its campaign on anti-EU sentiments. This formation is, not surprisingly, supported by former Eurosceptic president Vaclav Klaus. Why does the president play such an important role in the legislative elections? In theory, the Czech Republic is a parliamentary system. But this does not seem to suit the vision of Milos Zeman, who got elected by promising to be a more active president – and judging by the outcome of the popular vote, a majority of the Czech supported this proposal. Some analysts now argue that the Czech Republic is slowly shifting towards a semi-presidential system, as Milos Zeman is wielding unprecedented power - or rather influence – at least when compared to that of the two former post-revolution presidents, Havel and Klaus. Despite his campaign promise that he would be an impartial and above-the-melee president (a claim shared by both his predecessors), Zeman is subtly seeking ways to influence the final outcome of the elections. Zeman uses every chance to discredit the former right-wing government, and his picture appears on billboards of the SPOZ party with the quote “I will give my vote to SPOZ. Will you?” (the party denied that "I" refers to Zeman, but the connection is obvious). He also managed to weaken the Social Democrats by supporting the “pro-Zeman faction” within the party, because a weakened CSSD will theoretically mean more votes for SPOZ. Two weeks before the elections, it appears that the new parliament will either be controlled by a coalition that is loyal to Zeman or dysfunctional because lacking an organized opposition. Either scenario fits perfectly into Zeman’s conception of presidency – the parliament will be either too weak to confront him or it will be controlled by his supporters, leaving him room to widen and expand his presidential powers. It is clear that this future political constellation could informally turn the Czech political system from a parliamentary to a semi-presidential one – at least for the duration of Zeman's presidency.